Now I know I usually write about what DIY project I've just finished or about to start, but I've been thinking a lot about the things that actually inspire me and add that personal touch as we start turning our House into a Home. Pinterest has actually sparked a lot of my creativity and has given me numerous ideas....from photo wall murals, painted furniture, to how to use colors creatively and incorporate geometric patterns while adding life and personality to a space. I'm just one of the many cost-conscious consumers out there that want to incorporate style trends that are easy and inexpensive. Yes I said it...I like to be trendy, but I don't forget about the "basics" like woven or knotted textures, pieces that are easy and cheerful to live with, make a design statement, and serve as interesting foundations for a home, like upholstered furniture or casework in neutral colors. I love to look for unique, cost-effective ways to improve my home. I'll buy and restore secondhand furniture and accessories. Scour consignment stores and Craigslist because I have discovered the benefits of buying older, distressed pieces that are well made and affordable and add aesthetic interest to modern rooms. 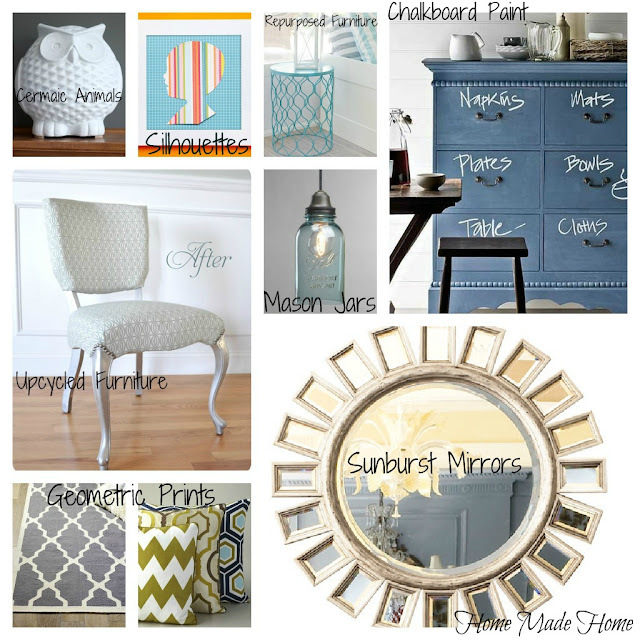 So where am I going with all of this....well here are some of my favorite trends and Pinterest finds right now. What trends are loving right now? Or better yet what's next? Project Pinterest Challenge: 2nd Place Winner! Caulk like a Pro: Cracks are Whack! Project Pinterest Top 12 Finalist! It Doesn't Make Any AdSense! Pinterest Challenge #4: Happy Composting!